Right out of the box, I'm going to say I LOVED this pattern. The directions were fairly basic, but that's all they needed to be. The whole thing, start to finish, took me around an hour. 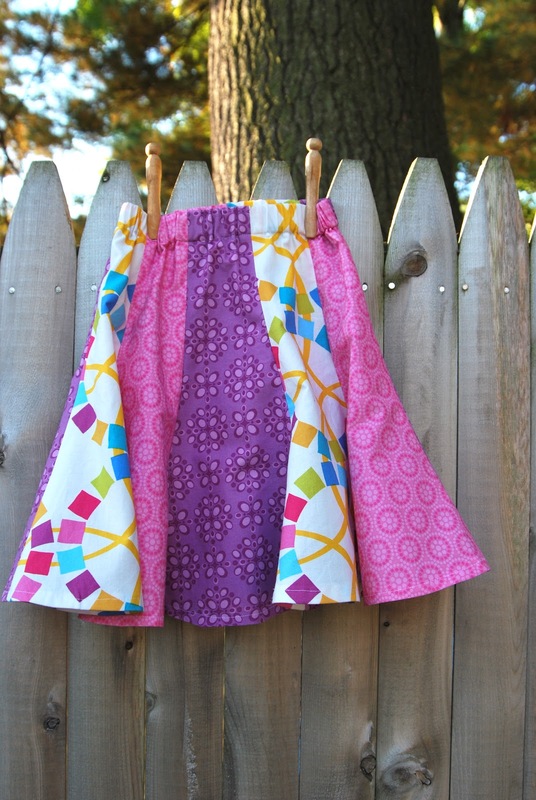 The number of panels you cut is determined by the size skirt you're making. There are three length and gore size variations. 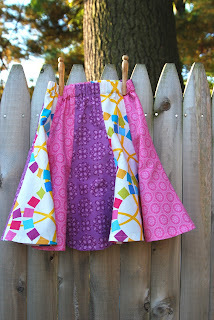 I made this skirt for the big sister of the baby I made the Seven Seas Quilt for. When the new baby comes, I wanted her to have something new, too. The skirt is very simple. I made the smallest size, which called for 9 panels, so I chose three fabrics so there would be an even number of each one. I also turned up the bottom and hemmed it...the pattern showed a simple serged bottom, but my cutting wasn't neat enough for that. This will make a fantastic twirly skirt. My daughter's already picking out fabric for hers. Overall I would give the pattern and "A". Simple directions, lots of sizes to choose from, options on how to finish it, and a spectacular finished product!